It was a road trip the Calgary Flames were dreading. Six games in a 10-day span with four matches played on back-to-back nights. Yet, somehow they emerged with seven of a possible 12 points, earning three wins and an overtime loss. Flames newcomer Kris Versteeg summed up the impact of the trip on the players in a recent conversation with the Calgary Herald. No NHL team has played more games this season than the Winnipeg Jets and the Calgary Flames (25 games a piece after Monday night’s action). Also, the Flames are suffering with Johnny Gaudreau out for at least five more weeks with a fractured finger and their other star forward, Sean Monahan, is under performing with just nine points in 25 games and a minus-9 rating. From a player perspective, it would be easy to feel sorry for yourself. You’re tired, your best offensive player is injured and your other top scorer is slumping. But, when the Flames were good on this trip, they played perfect road-game hockey. They remained disciplined and used their forecheck to create opportunities while being defensively responsible — even though goaltender Chad Johnson had to be spectacular to secure key victories in Boston, Columbus and Detroit. But, when the Flames didn’t play well, it was in fantastic fashion. They had very disappointing performances in Buffalo and Philadelphia. Those two games were winnable if not for a series of momentum-killing consecutive penalties when they had the lead. In Buffalo, it was six straight penalties that resulted in three power-play goals in just a 1:41 time span and in Philadelphia they lost the lead thanks to four straight penalties called against in the first and second periods. The Flames have struggled with discipline all season as the NHL’s most penalized team, but they have also had difficulty adapting to a changing style of play. Mix that with a grueling schedule and any team would be struggling. They’ve also lost a lot of scoring punch that hasn’t been easy to recover even though many players like Michael Frolik, Mikael Backlund, Matt Stajan, Matthew Tkachuk, Deryk Engelland and Troy Brouwer have all been bright spots on the roster. 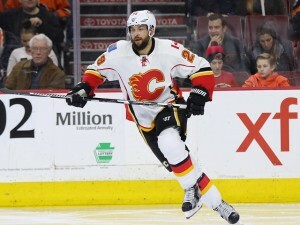 Still, after their most recent loss in Philadelphia, head coach Glen Gulutzan proved he wasn’t feeling sorry for his team as he unleashed on them to CalgaryFlames.com for allowing sloppy play to creep into their game even before they took the ice against the Flyers. “It’s the worst we’ve played from the start all season,” Gulutzan said. “I give them credit too. They did outwork us. They outplayed us. They were hungrier in all areas. They outpaced us. But it was coming for us. The second half of the Boston game we let [Johnson] clean up some of the messes we made in front of him. At this point in the season, the Flames are sitting right on the playoff bubble. Their play during this road trip has demonstrated the struggle the team has had with mastering a new style of play while walking that fine line between playing aggressively and taking bad penalties. On one hand, they’ve played extremely well at times. They’ve also been surprisingly dangerous while penalty killing with a league-leading five shorthanded goals. This, despite the fact, that their penalty kill itself still languishes in second to last place in the league even with recent improvements. On good nights, the Flames have scored by committee to pull off tight victories. Usually when the Flames win this season, it’s by a goal or two, but on bad nights when they lose, it’s been by a wider margin as evidenced by their league-worst goal differential ranking at minus-19. Right now, the Flames are a team without a major scoring star but right-winger Michael Frolik has been outstanding as a second line forward, leading the club with 14 points in 24 games (6 goals, 8 assists). This ranks him 77th overall in the NHL scoring race. Frolik and his linemates, Backlund and Tkachuk, have been the team’s most dynamic force on the ice on a consistent basis, but they’re not supposed to be the Flames’ top scoring line. The fact that they are speaks to their versatility and their ability to play any role assigned to them while being difference makers on the ice. They’ve scored key goals and agitated the opposition all season long to be key factors in a lot of Flames wins and the team will need more of the same from them in the games ahead. Are the Playoffs Within Reach? Before this pivotal road trip started, it would’ve been easy to predict the demise of the Flames this season. But, as they return home, they find themselves sitting within one point of a wild-card playoff spot. Coming home, they will look to regroup and work on solving their significant problems with team discipline, special teams and a lack of offense to compensate for the loss of Gaudreau. These are big hurdles to overcome and making the playoffs this season is probably a bit of a stretch even though the team is improving. However, the future still looks bright for the Flames. They have a strong crew of valuable prospects on the rise in Mark Jankowski, Morgan Klimchuk, Andrew Mangiapane, Rasmus Andersson and Oliver Kylington, who are all poised to make a big impact on the team within the next couple of seasons. As for the rest of this season, the key things to watch will be how the Flames will continue to remodel their roster and whether or not the team fully is able to buy into Gulutzan’s coaching philosophies. If not, it could be another summer of big change in Calgary.